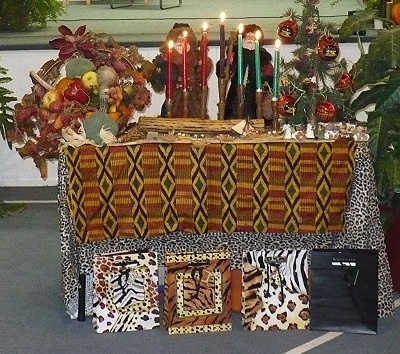 The Clay County African American Legacy Inc. will host the Northland’s 15th Annual Kwanzaa Celebration with a program beginning at 6:00 p.m. on December 27th at the Garrison School Cultural Center, located at 502 N. Water Street in Liberty, Missouri . The program is free and the public is invited to attend; tickets or reservations are not required. Community residents will participate in the lightning of the Kinara which represents the seven principles of Kwanzaa: Umoja (unity); Kujichagulia (self-determination); Ujima (collective work and responsibility); Ujama (cooperative economics) Nia (purpose); Kuumba (creativity) and Imani (faith). The program will also include singing, dancing, and a poetry performance by local residents. Liberty High School students participating in the Advanced Student Educational Mentoring Program (ASEM), that is co-sponsored by the Liberty School District and Garrison School Cultural Center, will receive recognition awards for successful academic achievement this semester. A potluck dinner will be held immediately prior to the program and everyone is welcome to bring a favorite dish.